A Dreadful Night While Traveling By Indian Railways – Grab a cuppa, tell a story or listen to one. I had a harrowing experience while traveling from New Delhi to Kanpur by a summer special train No 04040 – New Delhi – Patna. On the night of October 28,2013, the train left New Delhi at about 2:40pm in the afternoon and was scheduled to reach Kanpur at 9:30pm the same evening. The AC 2 tire coach in which I was traveling was not full to its capacity; many berths were unoccupied /not reserved. Among my co passengers there was a young lady and we jelled instantly. We started a conversation and we were both headed to the same destination. Meanwhile the train stopped many a times at unscheduled places and it was evident that the train would be delayed by more than two hrs and would reach Kanpur possibly after mid night. As the journey progressed, we noticed that the attendant on the train was consuming alcohol and was serving few other passengers as well. The alcohol was put in coke bottles in an attempt to mask the whole thing. Before going any further, lets state the facts first. Drinking and smoking is not allowed while traveling by Indian Railways. Drinking by staff is strictly prohibited by Indian Railways. This story goes further than that. 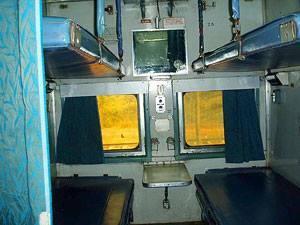 As it became dark outside, the drunken attendant came with two people and claimed that two sleeper berths which were unoccupied had been allotted to them by the TTE (Traveling Ticket Examiner, also called TT commonly). One of those two people was stone drunk and he was lurching. As there was no TTE and no security personnel in train, my co-passenger and I felt extremely uncomfortable. We told them that we cannot allow any person in the place where we were sitting. We suggested that these people can be adjusted somewhere else as many other births were unoccupied. The still somewhat sober passenger readily agreed but the drunk person insisted on occupying the birth, next to us as it was “allotted” to him by the attendant /TTE. On our refusal, he left for a short while but came back again and again insisted to occupy the seat. His mannerism was just not right. This was sheer harassment at this point, specially because we were two women traveling alone. He did not bother any other passenger in the coach. My co-passenger, a younger girl, was visibly scared. Truth be told, so was I. The other passengers around us overheard everything that was transpiring but kept quiet. No support came from any corner whatsoever. We knew we had to have a strategy of our own to avert things. So we took out our mobile phones and got talking to our families, narrating the incident that was happening. The next stop (nearest one) was the final stop, our destination. So even if we called Railway police, we would have gotten no help at all. We kept talking on our phone in audible tones till we reached our destination. Somehow, our strategy worked. Ultimately we succeeded in not allowing that drunk person sitting near us. We heaved a sigh of relief when the train reached Kanpur a little after midnight. Much to our surprise, while disembarking from the train we noticed more such people who appeared to be in a drunken state. This is one of the many stories where law is freely broken on public transportation in India. The law aside, as co-passengers, are we all not morally responsible to help each other and stand up for each other’s safety? Blaming the law and being mere onlookers makes one an equal participant in a crime. Hence sharing this story is important to me as I have done many times before. Anything could have happened to me and my fellow co-passenger that night. I shudder at the very thought every time I think of this incident. Picture and Story By : Sonali Banerjee. Time and again Sonali has talked about important issues in the society through her stories on our blog. Her previous post was similarly very thought provoking. Amazing right… Lady has time to write on blog about her 'apathy', but not to go file police complaint or even report to railway commissions. We always choose the easy way out, speak about what went wrong, but nothing about, what we could have done to make sure it doesn't repeat. I have a simple question to ask. How do you know if the police case was registered or not ? Please do not make an assumption when something is not mentioned in a story. Rather it would be better to ask a question instead to get your clarification. Speaking on social media has brought lot of changes and the onlookers being silent while witnessing a harrassment is not one that the Railway police can solve. Thank you for reading and hope you are not one of those onlookers who just witnesses something without doing anything about it. What a 'preaching' by a person who himself is hiding his own persona behind the veil of Anonimity.What is his frustration- that I shared my harrowing experience of saving myself and another fellow passenger,a young girl from being harassed by drunken fellows passengers (when other anonymous male co- passenger were feigning deaf n dumb and blind)? Or after coming out unscathed from that dungeon hours after mid night why I did not go straight to High court? By the way may I ask to Mr Anonymous , how many criminals he has taken to the court? My first priority on that night was to reach home safely and to arrange the same for my fellow passanger that young girl.